The Window Seat: Are There Really Always Two Sides to Every Story? Are There Really Always Two Sides to Every Story? In Journalism School, we were taught to always report on both sides of the story. That's what most media organisations do. 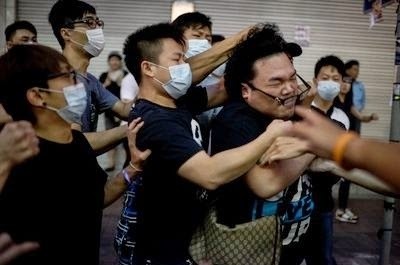 In many local newspapers and TV channels, after reporting how the police used pepper spray and tear gas against peaceful demonstrators, they quoted government officials or allies who said the police have exercised "appropriate degree of force". In a recent BBC programme, the host interviewed former Chief Secretary Anson Chan and Martin Jacques, author of When China Rules the World. While Anson Chan explained the students were fighting for the right to elect and to be elected, Martin Jacques claimed the 1200-strong nomination committee in Hong Kong was broadly representative of Hong Kong people. In a radio interview, Occupy Central co-founder Benny Tai explained their campaign and updated the strategies. Then, spokesperson for the anti-Occupy Central group Robert Chow said the majority of Hong Kongers were opposed to Occupy Central, citing the apparent 1.5 million people who signed his group's "Peace & Democracy" petition. After seeing and reading many of these news reports, I have started to question the saying "there are always two sides to every story". Are there really always two sides to every story? When one side is made up of blatant lies, are we still obliged to consider that a fair side? Are we still obliged to give that side of the story an equal weight? Perhaps it is the tradition of media organisations to report on both sides of the story, so as to be seen as balanced. So be it. However, when individuals commented on Occupy and the recent actions of the government and police, some have said, "Well, there are always two sides to every story." I've asked, "What is the other side of the story?" One of them replied, "I don't know. But there are always two sides to every story." Another way of putting it is "not everything is black and white". Of course! But sometimes, some things are so morally wrong that there is no grey area. Even if there is, all the more reason to cut through the mist with an honest view. Such "two sides" and "black and white" sayings would sometimes become an easy default position for people who don't want to be seen as "sided" with anyone. Some even go further saying, "I just want to remain neutral." "I support the students. But I also support the police who are doing their jobs." "I support democracy. But I also support maintaining an orderly society so students should disperse and go back to school." They may mean it when they say it. But I find it confusing as to what they really believe in and where they stand. Do they really think "each side" is of equal worth? If so, it would help if they are willing to explain what they like about each position. Sometimes people say, yes, they support democracy (in an abstract sense) but then decline to say exactly what kind of democracy, so it's impossible to know what it is they really support. Or they say, "I support the protestors' aims but not their methods," but then refuse any invitation to suggest any alternatives. I'll call this the Robert Chow school of logic. An alternative strategy some people use, which I'll call the "gobbledygook", is that they uncharacteristically say a lot of words and ask a lot of questions which lead to confusion. In the end, you are lost as to what they mean and what the points they are making. It's like voluntary Aphasia. It is as if people are not willing to take a stance. Maybe they don't wish to reveal their true view. Maybe they have an excessive regard for political correctness. Or maybe they just prefer to wait until it's clearer which way the wind blows, then align themselves with the winning side. But if people are unwilling to state their real views, how as a city or society could we make any progress? How can we show each other genuine respect and dignity? For the sake of Hong Kong, especially it's young people, I hope more people will speak up. In that spirit, let me give my view. Personally, I hope people would favour a peaceful transition to democracy and show the demonstrators their support. But if that's not their preferred goal, then at least I hope they would give us their honest view. Someone once said that, "All that's needed for evil to succeed is that good men do nothing". Or, I would add, say nothing. In times of moral crisis, if I stay silent or remain neutral, I risk abetting or condoning something that in my heart I know is wrong. Let's go back in time when advocates were in the movements of suffragettes, civil rights or the abolition of the slave trade. It would not be surprising if some people back then had said they supported both the "for" and "against" sides with regards to these rights. I would hope that, if I had lived in those eras, I would've identified with what we now know clearly to be the "right side". But I didn't live then. I live now. This is our time, this is our place, this is our issue. I see the violence carried out on peaceful protestors, first by the police, then by thugs with police's acquiescence. I feel a deep wrong is happening in Hong Kong. One that will scar us for generations. I hope more people speak out against it.